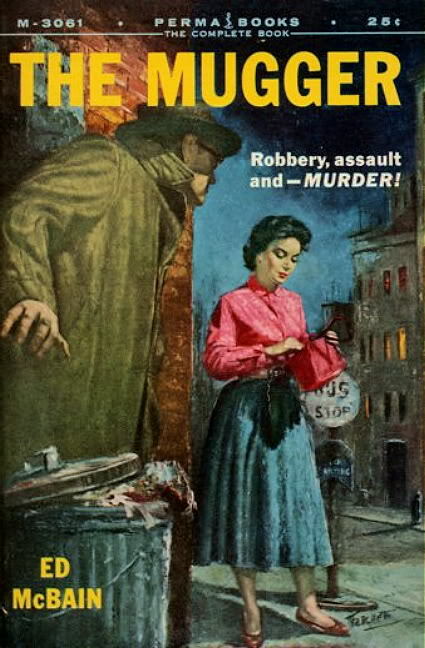 The Mugger, the second of Ed McBain’s 87th Precinct novels, begins directly after the events of Cop Hater (although it’s in no way necessary to read Cop Hater first). Detective Steve Carella is away on his honeymoon, so McBain takes the opportunity to give us some quality time with some of the precinct’s other employees, notably rookie cop Bert Kling, who gets talked into an unauthorized murder investigation, and compact judo expert Hal Willis, who’s on the trail of the title villain, sometimes with Detective Eileen Burke (making her series debut). No sophomore slump here, as The Mugger is in nearly every way an improvement on its predecessor. The mystery is better, and the characters are developing quite nicely. It’s also a bit darker, featuring a murdered teenager and vicious police brutality (which seems shockingly cavalierly treated). The city in these pages is imaginary. The people, the places are all fictitious. Only the police routine is based on established investigatory technique.